Ellen Stofan, the John and Adrienne Mars Director of the Smithsonian's National Air and Space Museum, will deliver the undergraduate commencement address on Saturday, May 11, at 10 a.m. on the campus quadrangle. The museum is the world’s largest collection of aviation and space artifacts, and is home to the Center for Earth and Planetary Studies. Stofan, who has more than 25 years of experience in space-related organizations and a rich background in planetary geology, will receive an honorary doctor of science degree. 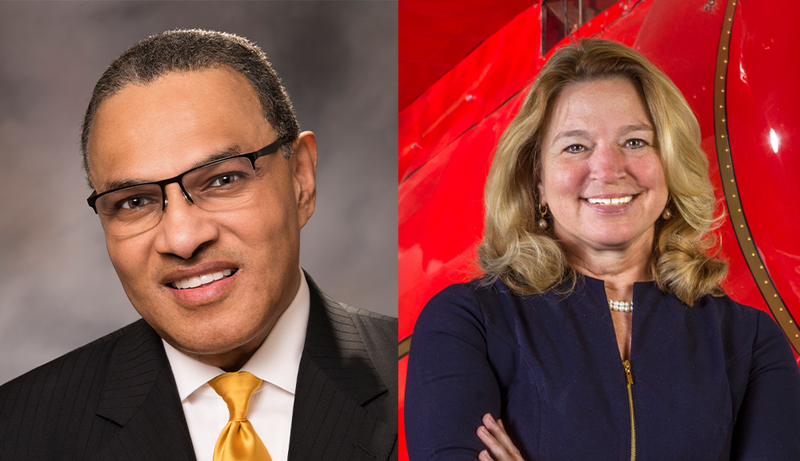 Freeman A. Hrabowski III, president of the University of Maryland, Baltimore County, will deliver the graduate commencement address on Thursday, May 9, at 5 p.m. on the campus quadrangle. Serving as president of UMBC since 1992, Hrabowski is a widely recognized leader in education, known for building UMBC into a well-respected research institution that was ranked the #1 Up and Coming University for six consecutive years by U.S. News and World Report. A mathematician by training, Hrabowski’s research focuses on science and math education, particularly minority participation and performance. He will receive an honorary doctor of arts degree. Gordon Hargrove, executive director of Friendly House in Worcester, will receive an honorary doctor of humane letters degree during the undergraduate ceremony, and Kevin O’Sullivan, president and CEO of Massachusetts Biomedical Initiatives, will receive an honorary doctor of science degree during the graduate ceremony. Prior to becoming the John and Adrienne Mars Director at the Smithsonian’s National Air and Space Museum in April 2018, Stofan was a chief scientist at NASA, serving as the principal advisor to former administrator Charles Bolden on NASA’s strategic planning and programs. She helped guide the development of a long-range plan to get humans to Mars, and worked on strategies for NASA to support commercial activity in low Earth orbit as it transitions from the International Space Station (ISS) to sending humans to the moon and Mars in the mid-2020s. She supported NASA’s overall science programs in heliophysics, Earth science, planetary science, and astrophysics. She has also addressed the World Economic Forum’s Council on the Future of Space Technologies at Davos and served as co-chair of the council. She has spoken at the World Science Festival, SciFest Africa, and numerous universities and schools around the world. From 2000 to 2013, she was vice president and senior scientist at Proxemy Research, a consulting firm in Maryland. Stofan graduated from the College of William & Mary in Williamsburg, Va., with a bachelor’s degree in geology, and from Brown University in Providence, R.I., with a master’s degree and a doctoral degree in geological sciences. As a postdoctoral fellow, she worked for NASA’s Jet Propulsion Laboratory in California and later became the deputy project scientist for the Magellan Mission to Venus. In addition to his duties as university president, Hrabowski serves as a consultant to the National Science Foundation, the National Institutes of Health, the National Academies, and universities and school systems nationally. He also serves on the boards of the Alfred P. Sloan Foundation, France-Merrick Foundation, Marguerite Casey Foundation (Chair), T. Rowe Price Group, The Urban Institute, McCormick & Company, and the Baltimore Equitable Society. In 1988, with philanthropist Robert Meyerhoff, he cofounded the Meyerhoff Scholars Program, which is dedicated to high-achieving students committed to pursuing advanced degrees and research careers in science and engineering, and advancing underrepresented minorities in these fields. Hrabowski has authored numerous articles and co-authored two books, Beating the Odds and Overcoming the Odds (Oxford University Press), focusing on parenting and high-achieving African American males and females in science. His most recent book, Holding Fast to Dreams: Empowering Youth from the Civil Rights Crusade to STEM Achievement (Beacon Press, 2015), describes the events and experiences that played a central role in his development as an educator and leader. He has also won numerous awards for his leadership, including being named one of America’s Best Leaders by U.S. News & World Report in 2008; one of America’s 10 Best College Presidents in 2009 and one of the “100 Most Influential People in the World” in 2012 by TIME magazine. He received both the TIAA-CREF Theodore M. Hesburgh Award for Leadership Excellence and the Carnegie Corporation of New York’s Academic Leadership Award in 2011; and the Heinz Award for his contributions to improving the “Human Condition.” He was among the inaugural inductees into the U.S. News & World Report STEM Solutions Leadership Hall of Fame in 2011. At the age of 12, Hrabowski became a Freedom Fighter, and joined the Children’s Crusade march for civil rights in his hometown, Birmingham, Ala., for which he was arrested and placed in jail for five days. He was also featured in Spike Lee’s 1997 documentary, Four Little Girls, on the racially motivated bombing in 1963 of Birmingham’s Sixteenth Street Baptist Church. He received a bachelor’s degree in mathematics from Hampton Institute. He also received a master’s degree in mathematics, and a PhD in higher education administration/statistics from the University of Illinois at Urbana-Champaign. “We are so fortunate to have such accomplished speakers and honorary degree recipients imparting their wisdom and spirit at this year’s ceremonies, and we are looking forward to this year’s celebrations,” said President Leshin.